Though he attained musical immortality through his songwriting and producing skills that brought hits to scores of New Orleans artists throughout the 1950’s, Dave Bartholomew’s own recording career was hardly an incidental sideline. His creative ideas first found an outlet with his own releases starting at the dawn of rock in 1947 and even after assuming the mantle of Imperial Records top producer in late 1949 he enjoyed a decade of solid releases under his own name, despite the fact they gradually took a back seat commercially to the work he oversaw for others. 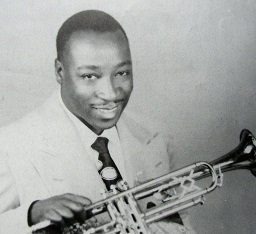 Born in 1920 in Edgard, Louisiana, Dave Bartholomew was taught the trumpet by Peter Davis, the same man who’d instructed Louis Armstrong, and by his teens Bartholomew was playing professionally. Soon after being offered the chance to join Jimmie Lunceford’s nationally renown swing band he was drafted into the Army in World War Two which changed his musical direction. Serving his hitch as a musician he was taught composing and arranging skills by a fellow serviceman and upon his discharge he put together a band of future notables in New Orleans with the intent on playing Dixieland jazz. Finding the musical winds had shifted in his absence Bartholomew gravitated towards the growing commercial sounds when local hero Roy Brown introduced rock ‘n’ roll in mid-1947 Bartholomew was quickly snatched up by the same label, DeLuxe, and recorded his first sides in a hybrid style. Though their failure commercially resulted in no new sessions for over a year he gained a reputation as the leader of the premier band in the city. Upon his re-emergence on record in 1949 his streamlined sound became the cornerstone of the New Orleans rock movement. Recording for King Records even as he was employed as a producer by Imperial, Bartholomew’s records were strong local sellers though with one national hit to show for it. His songwriting, arranging and production skills were evident throughout and were abetted by his adventurish trumpet playing and unique and engaging vocals. By the early to mid-1950’s his own recording career was secondary to his other more lucrative pursuits, but he remained a creative force whenever he stepped into the spotlight as an artist. By the mid-1960’s Bartholomew effectively retired both as a producer and a recording artist, choosing instead to pursue his first love Dixieland jazz in live gigs, as well as frequently touring as lead trumpeter with Fats Domino, whom he propelled to stardom, overseeing his studio output from 1949-1963. Though Bartholomew was elected to Songwriters Hall Of Fame, and the Rock ‘n’ Roll Hall Of Fame as a Non-Performer for his production work, his own records state the case that his career as artist was of nearly equal merit.